I’m in the middle of working on my next shadow painting. I took my time sanding and priming 4 layers of gesso on a lovely 2 ft. by 3 ft. piece of masonite, but it wasn’t until I was done the first layer of the drawing that I realized I had used charcoal rather than paint. Apparently it wants to be a charcoal work. So far I’m pleased it; I’ll see how it goes. Hopefully I will be posting that one next week. 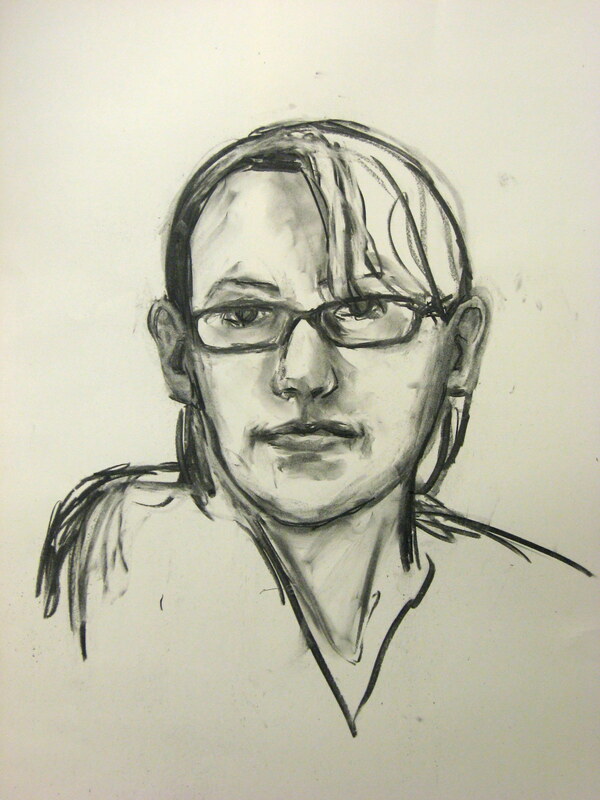 For now I have a quick charcoal study that I did after doing my painted self-portrait. I guess I did it because I got a lot of feedback that the painting that was very nice, but not quite “right”. My husband told me that in this one I had captured my likeness pretty much bang on and my response was that yes, I had captured my big ears, big nose, and stringy hair perfectly. Maybe that’s why it looks more like me. Maybe without meaning to I had idealized myself somewhat in the painted portrait. I’m looking at the charcoal study now and wondering if I did the opposite. Are my ears really that big? I think yes and no. Yes because they are pretty much that size, but no because I think I did a bit too much shading on them which actually draws attention to them. I still love the painted portrait, even if it’s not a perfect likeness. And I am warming to this one. I didn’t like it at first, but I am starting to see that it just looks like me. I wish I could look like me without my glasses. They seem to have permanently altered my face so that now when I wear contacts it looks like my nose is missing something. Dayna, just a question for you. Did you draw yourself using a mirror to see yourself? or use a photo. Because both can give different results. Your drawing is very good but I can see how your ears look more realistic because of the shading. That’s a good thing. I would continue the rest of your face in the same way you did your ears because as it is now you are looking somewhat pale against a white background. Look at the drawing of Poppy and do the same here. I look forward to seeing the results. Thanks for your feedback Marie. I used a mirror for both the sketched and painted self-portraits. I won’t be going back to this one as it was just a quick study gesture sketch that took about 10-20 minutes, more of an excercise to study myself. I will use what I see in this study for my next self-portrait. I “captured” myself fairly accurately and rather than go too far and risk losing that, I’m stopping and moving on. One of my print-making instructors once told me that I had a tendancy to go too far and overwork a piece. He told me that I should stop BEFORE I think I’m done. Afterall, you can always go back into it after reflecting on it for a time. The Poppy drawing was a prolonged work that I did over several days. A different way of working, so it was not drawn as loosly as this sketch.